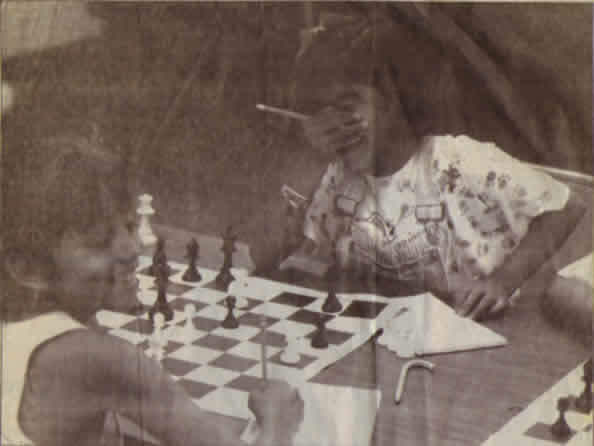 SAN CLEMENTE - The next Bobby Fischer could come from an unlikely place: the city's oldest elementary school, on the outskirts of a Latino barrio. At Las Palmas Elementary School, the ancient game of chess has captured the imagination of a diverse student population. Here, knights are often called caballos and rooks, with their slotted tops, are sometimes known as "ash trays." The reason: Eric Hicks, a Berkeley-educated chess whiz whom students have nicknamed the "Chess Master." Every Wednesday, as many as 50 children stay after school to learn chess skills from Hicks and his wife, Laura Ariza, who is bilingual. About half the club's adherents are Latino, with limited English skills, but it doesn't matter. Once players grasp the game, language and cultural barriers tumble like a vulnerable king under attack. "Chess transcends all languages - I've taught deaf kids before," said Hicks, a 26-year-old high school dropout who later earned a bachelor's degree in English from UC Berkeley and now writes computer software programs from his San Clemente home for a Bay Area company. Eyeglasses smudged and high-top sneakers untied, Hicks stood before his young charges last week. Regular classes had just ended at 2 p.m., but learning started anew in a large room filled with about 35 students. Small heads topped with black, brown and blond hair nodded. A few hands fidgeted. When it was time to play, the squirming stopped and the room fell still. "It's an opportunity for the kids to come together for the game itself," Principal Doug Kramer said. "They are not separated by language or race." The game also has become an avenue to motivate students in their school work. As sixth-grader Patrick Starr of Dan Point carefully studied the board, his mother commented on how her son has become more patient and methodical since taking up chess. His mother said Patrick has a learning disability, but among chess club members, which include "gifted" students, he is one of the top three players. "This has been wonderful," Barbara Starr said. "It's helped his self-esteem." Kramer said some students such as 11-year-old Patrick show promise in the chess club, which helps bolster teachers' efforts to reach them academically. At first, the principal was stunned at the turnout, but he credits Hicks, who recruited students in August before the club was launched. "He instills the idea that is you want to get better, you have to put in more time," Kramer said. "And that's very important. Kids today are 'just add water - instant everything,' but that's not what life is all about." ARIZA, 24, who holds a bachelor's degree in anthropology from UC Berkeley and is a loan officer for a San Juan Capistrano bank, never competed in chess tournaments as her husband does. But she stills knows the game plenty well, teaching the youngsters specialized moves and how to master them. First, though, the students must know the names of pieces and how they traverse the board before moving on to the 150-year-old Ruy Lopez strategy. "I give them the English name, but some of the students are limited in English so they assign nicknames or Spanish," said Ariza, whose parents came to the United States from the Dominican Republic. "A king is a rey and a queen is reina," Ariza said. Hicks, who has reached the chess level of expert, said he quit high school while living with his family in Hawthorne. He had played chess while younger. But at 18 he began playing chess seriously among the locals at Santa Monica beach and said he was surprised to find that some of the people he was beating were doctors and lawyers. "I failed out of high school," Hicks said. "I was a terrible student. I never did anything in common with people like this. And suddenly I did." He felt more confident. He entered El Camino College, then transferred to Berkeley, where he became an honors student, played on the chess team and taught the game to grammar-school children, earning enough money to support himself and pay tuition. He said he graduated the same year from UC Berkeley as the valedictorian from his high school. 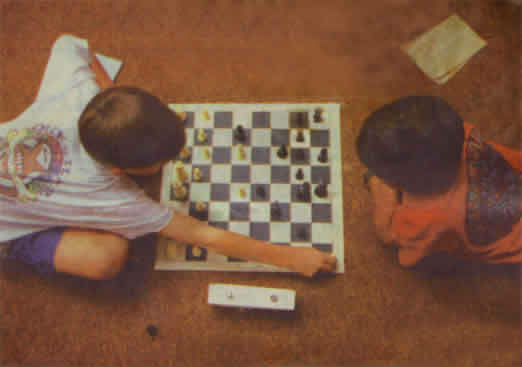 When he looks at a chess board, Hicks sees the same qualities required for scholastic success. He imparts the advice to students, who religiously record each game in notebooks so they can not only review how they might have won or lost, but learn from mistakes. "To do anything in chess, you have to take steps," Hicks said. "You can't just say, 'I want to win.' If it were just a game, I wouldn't do it."